We're proud to be one of the select practices to use i.Terminal by ZEISS, the advanced digital fitting technology for the most accurate eyeglass fitting measurements. i.Terminal by ZEISS takes special measurements of your frame and facial contours to produce a customized lens as individual as you. i.Terminal by ZEISS is a unique integrated dispensary system that combines a new level of fitting and measurement precision for eyeglass lenses and delivers an enhanced patient consultation. 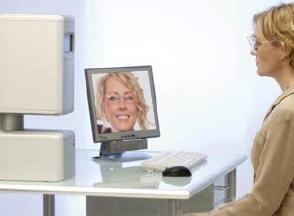 The patient can view images of themselves in their chosen frame to see how the frame will look when worn. Sophisticated modern progressive lenses offer unsurpassed optical performance. However, the performance of these lenses is still limited by the accuracy of their fitting and centration. Even small errors in fitting measurements can result in up to a 25% reduction in progressive viewing zone alignment and lens performance. By consistently delivering the most precise measurements, i.Terminal assures that you receive the best possible visual experience from your lenses. The enhanced mirror allows patients with stronger prescriptions to see clearly how their chosen frames look when worn, and to compare multiple frames side-by-side. Other interactive capabilities of i.Terminal help you understand how premium lens upgrades will look and perform. These capabilities allows you to make more informed and confident eyewear choices. Sophisticated free-form lenses will deliver optimized performance when the design has been customized for the shape of the your chosen frame, as well as for the wrap, pantoscopic angle, and vertex distance of the frame as worn by you By taking all of these measurements automatically, i.Terminal facilitates the use of customized progressive lenses without adding significant time or complexity to the dispensing process. i.Terminal eliminates measurement error, while taking measurements to within 0.1 mm, resulting in the most accurate fitting measurements possible. i.Terminal employs a precision digital camera that captures both frontal and profile images of you wearing your chosen frame. A patented laser speckle target system is used to ensure that you maintain proper distance fixation while the photo is captured. The system is also designed to ensure that the you are properly centered for the most accurate measurement possible, and i.Terminal will automatically compensates for any accidental head-turn. The images are then processed by sophisticated software that automatically takes key measurements with unparalleled accuracy, including monocular interpupillary distances, fitting heights, pantoscopic angle, and vertex distance.